All the women’s healthcare you need, all in one place and personalized amenities at the Women’s Pavilion, located at Ochsner Baptist. We’re making it easier for you to connect to the expert care you need. At the Women's Pavilion, you’ll be able to have obstetric visits, have a baby, or even see a high risk maternal fetal medicine physician. Choose Ochsner Baptist for the birth of your baby. Ochsner Baptist features advanced technology in obstetrics and baby care in a comfortable, caring, and peaceful environment. Let Ochsner Baptist provide you with the information and care you need as you prepare for the joy of bringing a new life into the world. Learn the A’s to Z’s of your pregnancy. Click here to download the A to Z Guide to Pregnancy. The Perkin Alternative Birthing Center features a staff of Certified Nurse Midwives who provide mothers with a natural, holistic birth experience in a homelike environment. For more information, please call 504-894-2880. Located in the Ochsner Baptist Women’s Pavilion, making it the only hospital-based alternative birthing center in the region. Midwives offer comprehensive prenatal care in the Perkin ABC clinic, where they help mothers design individual birthing plans, including water birth, labor support and alternative birth positions. Two birthing rooms, each set up like home with a comfortable double bed and a family room and shared kitchen for guests to relax and visit during labor and delivery. Each room in the ABC offers a birthing tub and birth stools. Room service available for Mom and Dad. Accommodations include a comfortable place for new dads to sleep. Stock up and shop for items new parents will need when they bring home their new bundle of joy at the O Baby Gift Shop. Highest Level Neonatal Intensive Care - Ochsner Baptist Women’s Pavilion offers the highest level (Level III) Regional NICU, staffed by our experienced team of board certified neonatologists. 54 NICU beds available, including Private NICU Rooms. 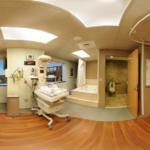 Ochsner Baptist is recognized as a Baby-Friendly birthing facility. This designation recognizes birthing facilities that offer mothers the environment, education and support needed for the most optimal birth experience. Learn more. View the current class schedules. To register for classes, call 504-842-4155. Can't fit classes into your busy schedule? Contact Jeni Ducoing,RNC-OB at jducoing@ochsner.org about online class options.